Today, one French person in two would like a change of career. In this context, creating a business through franchising appears as an increasingly obvious option for an employee or freelancer looking for a career change. Why so? Controlled risks and the reassurance of support. Franchising is a model that attracts more and more applicants every year. And for good reason; it is the ideal solution for many wishing to start out on their entrepreneurial adventure - remaining independent while making the most of the strength of a network and the notoriety of a well-established brand. 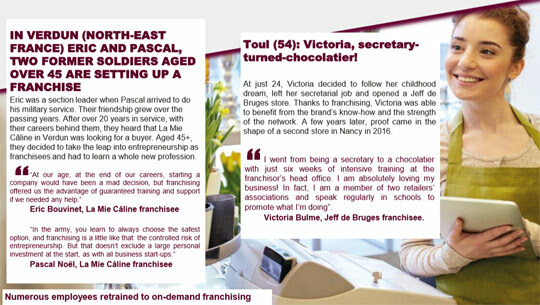 The figures speak for themselves: of France’s budding entrepreneurs, 44% of them contemplate franchising. "By relying on the notoriety and know-how of a brand, benefiting from network support and regular training, franchisees don’t have to take their first steps as a business owner alone. For entrepreneurs, franchising has a threefold advantage: independence, minimal risk and a franchise-specific business”, explains Chantal Zimmer, General Delegate at the French Franchising Federation. Open to all types of people, franchising attracts many former employees (76%, of whom 74% from the private sector). Mostly, these people are on their 2nd or 3rd career, and some have done a complete 180° turnaround or made a radical life change! With over 560 exhibitors expected (with 480 brands), the 2018 edition looks promising, with almost 140 first-time exhibitors and 90 business sectors represented, including 3 leading-edge sectors: catering (19% of exhibitors), services (12%), food retail (11%). The whole of 26 March will be devoted to “Facilitating Career Change through Franchising”. Also, in the “École de la Franchise” area, concrete topics including “Successful Career Change. They were Employees. They became successful franchisees” (25 March), or “From Employee to Entrepreneur: they made a success of it” (27 March). "The program is geared toward bringing projects to fruition with educational talks, case studies and personal support tailored to each professional project. In fact, last year 76% of visitors planned on going ahead with their project in the coming year!” concludes Sylvie Gaudy, director of Franchise Expo Paris.